Former president Robert Mugabe and President Emmerson Mnangagwa (file photo). President Emmerson Mnangagwa Wednesday took the occasion of his inaugural address to the United Nations General Assembly in New York to regurgitate his predecessor Robert Mugabe's anti-sanctions call. "We call for their (sanctions) immediate and conditional removal... " Mnangagwa said in an address which ended moments before midnight, Zimbabwe time. Washington in 2001 enacted the controversial Zimbabwe Democracy and Economic Recovery Act which blocks American firms and those with American interests from engaging in any form of trade with Zimbabwe while slapping a US travel ban and asset freeze on Mugabe and his inner circle. 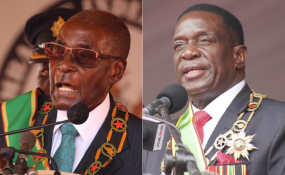 The sanctions were imposed in an ostensible attempt by the super power to force the Zanu PF led regime to restore the country back to the observance of human rights and democracy following what critics alleged were stolen elections by Mugabe. In his many appearances at the global event, Mugabe ranted about sanctions being illegal. His calls went largely ignored. However, Mnangagwa Wednesday chose to walk in the all familiar path as he described the US sanctions as illegal and hence, should be removed unconditionally. US ambassador to Zimbabwe Brian Andrew Nichols said Tuesday that his country was prepared to lift sanctions if the Mnangagwa administration stuck to the dictates of the constitution in running the country's affairs. Mnangagwa said he had just presided over peaceful elections July 30, a sign he said represented the maturing and entrenchment of democracy in Zimbabwe. He added, "We are grateful to the United Nations and either member states for sending election observers and for the technical assistance received by our election management body. "The recommendations will be taken into account as we deepen our democratic and electoral processes. "We shall continue to entrench constitutionalism, democratic traditions and norms, peace unity and harmony for it is indeed under such conditions that sustainable development, inclusive economic growth and prosperity can occur." The country's new leader has evidently been embarrassed by post-electoral violence which engulfed Harare city centre August 1 with at least six civilians gunned down by soldiers. "The isolated and unfortunate incident of post-election violence that occurred on the 1st August 2018 is regrettable and most unacceptable," he said. The President said he has since assembled and sworn in a Commission of Inquiry comprising locals and foreigners to investigate the ill-fated events of August 1. "The ultimate report and recommendations shall help us to bring closure to the matter and assist in the improvement of our governance," he said. Mnangagwa said elections in his country were now over, adding that he was concentrating on returning the troubled country back to its yesterday economic glory.